Course: International Conference on "Foresight Studies on Work in the Knowledge Society"
International Conference on "Foresight Studies on Work in the Knowledge Society"
"Foresight Studies on Work in the Knowledge Society"
This conference will be organised by IET, the Research Centre on Enterprise and Work Innovation, at the Faculty of Sciences and Technology of "Universidade Nova de Lisboa" (FCT-UNL), on 26 and 27 of January with the support of the European project WORKS-Work Organisation Re-structuring in the Knowledge Society (financed by the European Commission, and co-ordinated by HIVA Leuven). The main objective is to analyse and discuss research findings and methods on the trends of work structures in the information and knowledge society, and to debate concepts on new work organisation models and forms supported by ICT. 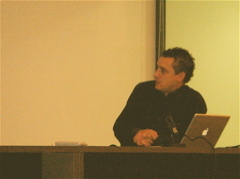 This 2nd Conference will be held on January 2009. Invited are different scientific disciplines like sociology, computer sciences, economics, ergonomy, history, psychology etc. 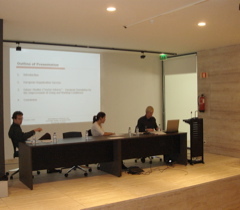 as well as representatives out of the field of social science and the field of economical practice. The conference language will be English. Abstracts should be not longer than two pages to be send by email to Prof. António B. Moniz (abm@fct.unl.pt) or Mrs. Margarida Paulos (margarida.paulos@fct.unl.pt). The selection will be done until the end of that month. Date: 19 and 20 October 2006. 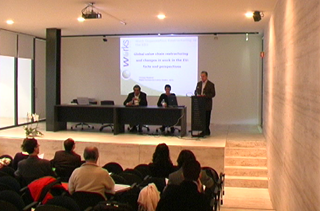 This conference was organised by IET, the Research Centre on Enterprise and Work Innovation, at the Faculty of Sciences and Technology of "Universidade Nova de Lisboa" (FCT-UNL), on 19 and 20 October 2006 with the support of the project CodeWork@VO (financed by FCT-MCTES, and co-ordinated by INESC Porto), and related with the European project WORKS-Work Organisation Re-structuring in the Knowledge Society (financed by the European Commission, and co-ordinated by HIVA Leuven). The main objective is to analyse and discuss research findings on the trends of work structures in the information and knowledge society, and to debate concepts on new work organisation models and forms supported by ICT. With the common support of CodeWork and WORKS projects. 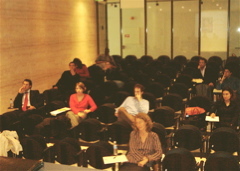 Organised by the IET research line on "Innovation systems and foresight analysis". 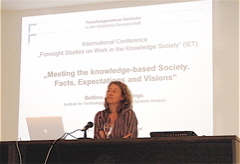 "Meeting the knowledge-based society. Facts, expectations and visions"
"Towards an effective integration of collaboration and information management"